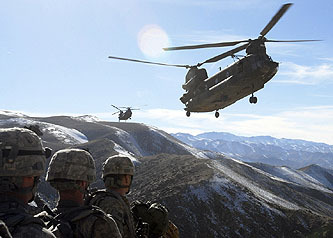 President Obama plans to further bolster American forces in Afghanistan and for the first time set benchmarks for progress in fighting Al Qaeda and the Taliban there and in Pakistan, officials said Thursday. ….Although the administration is still developing the specific benchmarks for Afghanistan and Pakistan, officials said they would be the most explicit demands ever presented to the governments in Kabul and Islamabad….American officials have repeatedly said that Afghanistan has to make more progress in fighting corruption, curbing the drug trade and sharing power with the regions, while they have insisted that Pakistan do more to cut ties between parts of its government and the Taliban. Mr. Obama telephoned President Hamid Karzai of Afghanistan and President Asif Ali Zardari of Pakistan on Thursday to share the main elements of the strategic review. I was a big proponent of setting benchmarks and milestones in Iraq, so I can hardly complain about this without grossly contradicting my past instincts. But I guess you can just call me Walt Whitman this morning, because at a gut level something about this whole plan makes my blood run cold. It’s so McNamara-ish I can practically see him making the announcement in my mind’s eye. On a less purely emotional level, the key thing here is how Obama plans to make these benchmarks credible. The problem with benchmarks in a war like this has always been the unlikelihood that an American president will withdraw troops without at least pretending to have achieved victory. I mean, how do you do it? Withdrawing support piecemeal because specific benchmarks in specific regions haven’t been met makes no sense tactically, but stepping up to the press room podium one day and announcing, “We’re losing, so we’re pulling out” is political suicide, and everyone knows it. In related Afghanistan news, David Brooks becomes about the millionth person to kinda sorta change his mind about one of our overseas quagmires after visiting in person and getting six days of full-court press treatment from the folks on the ground. The arc of his column was so predictable I practically could have written it myself. For something different, check out Sarah Chayes, an aid worker in Kandahar province. She admits that things are going badly, but guess what? That’s a reason to double down too. “The answer is not to lower the bar but to raise it. What is needed is some of that patented Obama ‘Yes, we can!’ energy.” Sigh. OK, fine: I’m in a sour mood this morning. Just consider this a vent. But I can’t say that anything I’ve read or heard makes me more optimistic about Afghanistan today than I was yesterday. I sure as hell hope that Obama knows what he’s doing.